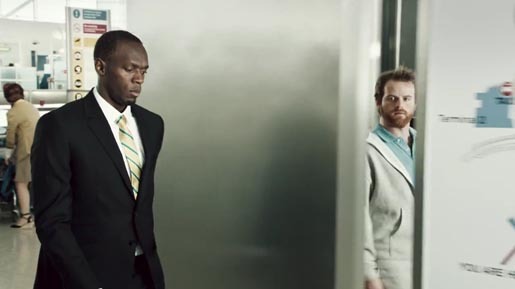 Visa partnership in the 2012 Olympics was promoted in March with “Usain Bolt vs London”, a commercial featuring a race across London between Usain Bolt and a guy with a Visa. When a red eyed Sam locks eyes with Usain Bolt across an empty luggage carrousel he does what every man in his position would do. He challenges the fastest man in the world to a race. What ensues is a race through the sights of London as both Sam and Usain use their Visa cards to replace their lost luggage. From pedalos in Hyde park, tourist maps in Trafalgar square and a dash across the millennium bridge. We take it all in before reaching our climatic finale at the start of the 100 metre final in Stratford. Here we reveal Sam, smartly dressed, starter gun in hand, ready to begin the greatest race at the Olympics. But he’s just won his own, having just pipped Bolt to the stadium. The Usain v London ad was developed at Saatchi & Saatchi London, by executive creative directors Paul Silburn and Kate Stanners, copywriters Ollie Wolf and Laurence Quinn, art directors David Goss and Mark Norcutt, agency producer Kate O’mulloy, production assistant Nicola Turek, account supervisor Matt Kandela, account manager Darapen Vongsa-Nga, Visa client partner Michelle Greenhalgh. Filming was shot by directing collective Traktor via Partizan, London, with executive producer Richard Ulfvengren, producer Miranda Johnstone, and director of photography Tim Maurice-Jones. Post production was done at Moving Picture Company, London, by VFX Producer Chris Allen, VFX supervisors Rob Walker and Jim Radford, CG lead Tim Civil, VFX team Alex Cernogorodos, Sumesh Chammancheri, Tim Civil, Jama Djurabaev, Raju Ganesh, David Gibbons, Saber Jlassi, Adam Leary, Yousuke Matsuno, Samantha Meisels, Andrew Roberts, Fiona Russell, Kunal Sarkar, Jim Spratling, Rob Walker, colorist Jean Clement Soret. Sound design and music arrangement were produced at Grand Central by Gary Turnbull. Music is “Hundred Mile High City” by Ocean Colour Scene (Cradock/Fowler/Harrison/Michella).